It's one of the most frustrating applications of modern times - the automated menu when you call a company with a question. Wouldn't it be nice to be able to talk to a person without 20 minutes of pushing buttons, rerouting and disconnections? 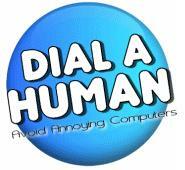 Check out Dial a Human. This site lists telephone numbers and corresponding number codes - even voice prompts - to use so you can start talking to a human as fast as humanly possible. Many major companies are listed, as well as some on the fringe. The site encourages you to report numbers that don't work and submit new numbers. Numbers can be sorted alphabetically or by category.